If you have important notes in OneNote and you don't want to forget about them, you can flag them for follow-up so they show up as tasks in Outlook. You’ll need a fully licensed version of Outlook installed on the same computer as OneNote before you can flag a note as an Outlook task. If you don’t need to link a note with an Outlook task but you want to quickly find it later, you can apply a tag to a note. Tags are a good way to mark important notes and they aren’t linked to Outlook. By linking a note to an Outlook task, you can assign the task to someone on your team, set a reminder, and track the task in Outlook. In OneNote, place the cursor at the beginning of the line of text you want to flag as an Outlook task. On the menu that appears, select a due date for the flagged note. Click Custom if you want to open the Outlook Task form and see all available follow-up and tracking options. A red Outlook Task flag next to a note on a OneNote page means the note is linked to Outlook for follow-up. To change a task after it’s been flagged, right-click the red flag next to the task. 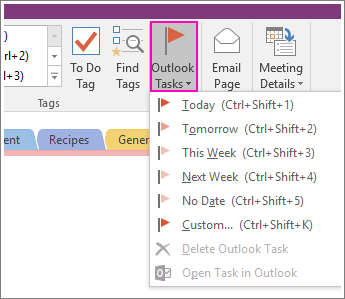 To remove a task flag, right-click it on the OneNote page and then click Delete Outlook Task.